The BBC has "failed" in its duty to give staff equal pay and opportunities, and needs "a more transparent" pay structure, a group of MPs has said. The Digital, Culture, Media and Sport (DCMS) select committee suggested women at the corporation were earning "far less" for doing comparable jobs. The inquiry was sparked by presenter Carrie Gracie, who had accused the corporation of pay discrimination. The BBC said much of the report was out of date but there is "more to do". It said reforms to its pay structure now "ensure fairness and give an unprecedented level of transparency". Director general Tony Hall said: "This report is looking backwards and has not caught up to where we are. In the last year, our gender pay gap is one of the lowest in the media in the UK, if not the lowest. "It's come down in the last year by 20%, and we're the only organisation in the UK who's committed to getting our gender pay gap down to equal by the end of 2020." The committee's findings come on the same day as the publication of Ofcom's annual report on the BBC, which assesses how the corporation is performing. More transparency on why major decisions have been made or how projects have been developed. For example, changes to the iPlayer or the plans for a new BBC Scotland channel. Being more innovative and taking more risks with original programming, both in commissioning and creating content. Attracting more young people. Ofcom said younger people are more likely to listen to commercial, rather than BBC, radio stations, and that few young people choose to watch BBC Three content online. Representing UK society better, for example by featuring more older women on TV, portraying national identity without stereotypes, and representing disabled people in a way that doesn't just focus on their struggles from having a disability. In July 2017, the publication of the BBC's highest-earning presenters revealed an imbalance between the numbers of men and women at the top of the list, leading to an outcry and the corporation commissioning three separate reviews into pay. But the DCMS committee's report said a new BBC pay framework was "of no use in helping women compare their salaries to those of their male colleagues". The committee's chairman Damian Collins MP said the BBC "must take urgent action now". "The BBC acts as a beacon in public life. As an employer it has an even higher level of duty than others to advance equality of opportunity - but this it has failed to do," he added. The MPs also criticised the BBC's investigations into pay, saying the corporation had "failed adequately to consult staff". In June, the BBC apologised for underpaying Ms Gracie, BBC News's former China editor, compared with the male international editors, and gave her back pay. Gracie left her role in January, accusing the BBC of operating a "secretive and illegal pay culture" and said it was facing a "crisis of trust". The MPs said the episode pointed to a "culture of invidious, opaque decision-making". BBC star salaries 2017-18: Who earned what? The BBC said: "Recent disclosures by other media organisations show that the BBC's gender pay gap is amongst the smallest and well below the national average. But we do hold ourselves to a higher standard. "That is why our action on pay has seen the BBC make real progress in addressing equal pay cases". The corporation highlighted its audit of equal pay and future planned reviews of pay transparency, as well as the introduction of independent oversight to resolve disputes and steps to rebalance "top talent pay". The BBC added that its reform to pay structure would "ensure fairness and give an unprecedented level of transparency and information about pay ranges for all staff". 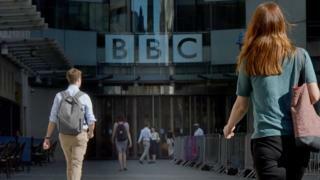 But BBC Women, a group representing female journalists and producers, said the MPs' report revealed there was "intractable processes, lack of transparency, evasive tactics, and no genuinely independent oversight" at the corporation. "BBC management should lead by example, implement the recommendations made by the select committee immediately, meet its legal obligations on pay," it said.